the coming of a new animal is a joyful thing......"
We started out with standard Australian Shepherds that we used to help us gather and work our bucking bulls. People who came to our bull ridings and seen our dogs work, asked us if we had any pups for sale. Our dogs were intelligent, easy to train and tough workers. They loved to be with us and lived to please. 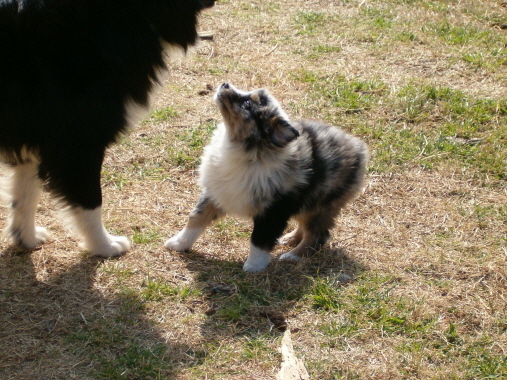 When we sold our bucking stock we went to the smaller mini and toy aussies. We're raising puppies first of all for great companions and pets. They also excel in shows, agility, therapy dogs and even with their small size are excellent stock dogs. We screen our adults for great temperments, health, conformation, and easy trainability. We will never be a large kennel. We only have a few dogs so we can give them the love and attention they need. Our dogs are happy, fun loving, outgoing and easy to train. They love to help you work stock or just go with you and be your faithful companion. They want to be with you at all times and love to travel and be part of the family. They are loyal, devoted and love to play! We're breeding to keep the good conformation and bone of the working aussie, but in a smaller mini package. Our dogs are making great companions. Some are competing in agility, others are being used for therapy dogs, and of course some are working livestock. We have many repeat customers and happy owners, dogs, and puppies in Canada and almost every state in the U. S.